Director Wolfgang Petersen (Poseidon) is teaming up with Mattel to make a movie based on the classic toy “Rock ‘Em, Sock ‘Em Robots”. Much like Stretch Armstrong (which is also being adapted into a movie), Rock ‘Em, Sock ‘Em Robots is a toy that’s fun for about five minutes before you get bored. It involves moving two sticks with buttons on them and each player trying to knock their opponent’s robot’s head off. The winner is whoever decapitates the other robot first. Pajiba also reports that screenwriter Kurt Wimmer (Law Abiding Citizen) is possibly attached to pen the screenplay. If the idea of a movie based on this concept sounds familiar, it’s because Shawn Levy is making his own robot-boxing movie called Real Steel. It stars Hugh Jackman as a fight promoter who reunites with his estranged son to take a robot to the championship round. 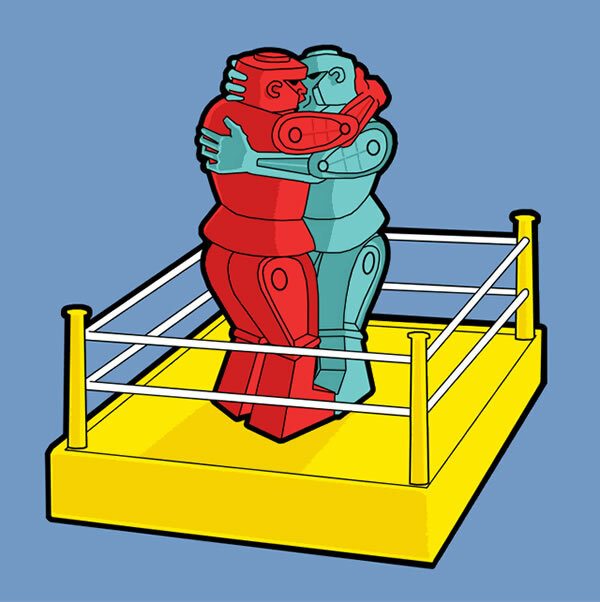 Hit the jump to see a commercial for Rock Em’, Sock ‘Em Robots.